Joel S. Miliband is a partner in the Litigation and Arbitration group in California, and the General Counsel and Chief Legal Officer of the Firm. 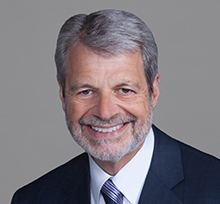 He has a wide range of experience in complex business and commercial litigation, including class actions, contract, financial fraud, corporate and partnership disputes, franchise litigation, real estate and construction, representing individuals, private business organizations, Fortune 500 companies, and governmental entities and agencies. He also represents parties in corporate insolvency matters. Joel has appeared in state and federal trial and appellate courts, as well as alternative dispute resolution forums hearing arbitrations. Successfully represented CEO of international pharmaceutical company in multi-jurisdictional litigation to regain control of the company’s international operations. Defended and favorably settled claims arising out of a leveraged restructuring and sale transaction brought against the former founder and principal of one of the nation’s largest manufacturers of nutraceuticals, by creditors holding $225 million of bond debt acting pursuant to a confirmed chapter 11 liquidating plan of reorganization. Successfully represented real estate partnership in litigation over control of a 105-acre mixed-use commercial real estate project including a retail center and nearly 4 million square feet of constructed or entitled office, hotel and residential space. Recovered seven-figure settlement for client after obtaining pre-judgment writ of attachment in a contract claim seeking payment for 1,734,000 gallons of denatured fuel grade ethanol. Recovered judgment after trial, affirmed on appeal, for client arising out of damages resulting from defendant’s refusal to honor contractual supply obligations to take advantage of price spike in the spot market following Hurricane Katrina. In over three years of litigation, successfully defended developer of large shopping center against lender with secured claim in excess of $90 million, allowing developer to ultimately sell the project. Recovered $7 million judgment for client after arbitration award based on overpayment of royalty and license fees. Successfully represented a class of 20,000 California teachers seeking recovery for the diversion of cash in the operation of more than thirty publicly syndicated real estate limited partnerships, achieving a recovery in excess of $20 million. Defended and obtained a favorable settlement for two subsidiaries of a Fortune 500 company against claims of fraud and unfair business practices with claims aggregating in excess of $200 million. Successfully defended class action brought by enrollee in a tax preparer course on behalf of thousands of putative class members, defeating class certification in the trial court, and obtaining dismissal of the appeal from that denial. Successfully defended the largest car auction in the nation against class action brought on behalf of used automobile dealers, obtaining reversal in the appellate court of initial class certification and thereafter defeating class certification in the trial court. In a unique class action matter, represented a class of investors with members of the Official Creditors Committee as representative plaintiffs, obtaining a recovery against an attorney for malpractice. Represented organization of restaurant franchisees in securing contract rights through negotiation, litigation, and ultimately representation in connection with the franchisor’s bankruptcy. Successfully defended one the nation’s largest franchisors with over 10,000 company and franchise owned locations, against a franchisee alleging breach of contract and unfair business practices, obtaining not only a dismissal of all claims, but a monetary judgment in favor of the client as well as injunctive relief enforcing a covenant not to compete. Successfully defended nationwide franchisor against contract and fraud claims of franchisee, obtaining dismissal of all claims before trial and defending the judgment on appeal. Successfully represented non-debtor developer in connection with its interests in 30 real estate debtor entities in litigation with Lehman Bros., who had financed the projects with $2.3 billion before Lehman’s collapse in September 2008. Represented a water agency incident to its attempt to acquire the assets of a regional water company wholly owned by the debtor in the Landsource Communities Development, LLC bankruptcy. Represented a city in connection with securing valuable water rights in over 9,000 acres of real estate wholly owned by a California debtor, subject to secured debt of a lender in its own bankruptcy proceeding in Texas. Represented the Official Creditors’ Committee in a large real estate investment/development company case and successfully negotiated with the debtor to confirm a 100% plan of reorganization to pay more than $12 million in creditor claims. Successfully represented the debtor, a landmark 500-room hotel adjacent to the Convention Center and Disneyland in Anaheim, California, in confirming a plan of reorganization restructuring the hotel’s $21 million secured debt. Represented the largest creditor in the Del Taco bankruptcy case, and participated as client’s representative on the Official Creditors’ Committee.